Kevin Stani Wins the 2010 PokerStars.com EPT Tallinn (€400,000)! This has been one of the most exciting final tables we've seen at any EPT, and a worthy conclusion to the inaugural EPT Tallinn, featuring as it did Team PokerStars Pro Arnaud Mattern, Italian EPT veteran Nicolo Calia and popular Dutch pro Steven van Zadelhoff. After eight hours of fast-paced play, young online qualifier Kevin Stani from Norway has finally triumphed to join Mattern in the exclusive EPT champions' club. The top three players in the chip counts had around three quarters of the chips in play at the start of the day, and indeed they would end up taking first, second and third place after the swift eliminations of the five short stacks. 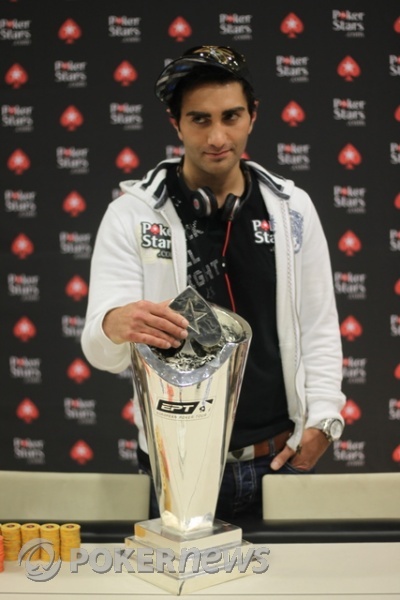 However, the order in which they finished did not ultimately reflect their stack sizes at the start of the day, and Stani, who started the day second in chips, got to take home the trophy. 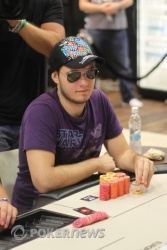 All eyes around the final table when play began were on French Team PokerStars Pro Arnaud Mattern. Given that he was the chip leader with 30% of the chips in play, he looked to be in a great position to become the first ever double EPT winner - having taken down EPT Prague in 2007, as well as finalling EPT Warsaw in 2008, he was both the most most familiar face at the table, and the most experienced man when it came to the live endgame. However, Arnaud found himself the shortest stack three-way after a huge bluff from Stani. Mattern got his whole remaining stack in a short while later with pocket queens against Stani's pocket threes, and following a cruel three on the turn, Mattern had to settle for third place. Stani had a 2:1 chip lead when they went heads up, and his opponent, 22-year-old Russian Konstantin Bilyauer, never managed to get ahead. Bilyauer was short for some time when he called all in on the final hand, and once it became apparent that Stani was holding the nuts, he had to settle for second. Still, this represents an astounding first cash for the young player who was taking part in only his second ever live tournament. 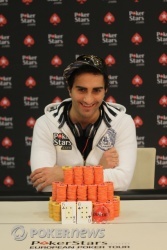 Although this is his first big live win, Stani is no stranger to poker success. He won the Sunday 500 on PokerStars for around $100,000 a year ago, and enjoyed a fifth place finish for $130,000 in the WCOOP High Roller event last year, and he went deep into the money at this year's WSOP Main Event, eventually finishing in 127th place. Having already proved himself a player to watch, he has now cemented his position in the upper echelons of the poker firmament. It has been a great week here for poker in Estonia, and a fine time truly has been had by all. Many thanks to all at the Olympic Casino and the Swissotel Tallin, and of course thanks to all at PokerStars. From PokerNews.com in Tallinn, it's aitäh, as they say in Estonian, and goodnight. Kevin Stani opened for 25,000 on the button and Konstantin Bilyauer called to see a flop. They both checked. The turn was the and Bilyauer now bet out 375,000. Stani remained motionless for a moment, and then raised to 875,000. Bilyauer called. They saw an river and this time, after a pause, Bilyauer bet out 1.2 million, leaving himself just 1.4 million behind. Stani paused... and paused... and then announced all in. Bilyauer sighed deeply and smiled. He dropped his head, and stared intently into his lap for some time. Eventually he stood up, but continued to tank for a while, playing with his remaining chips. Whatever Bilyauer called all in with, we will never know, as Stani turned over for the nuts and Bilyauer mucked his hand. The young Russian will have to settle for second place and a rather nice €250,000 for his first ever live cash, because with that, we have ourselves a winner. Konstantin Bilyauer raised to 250,000, and Kevin Stani called. Flop: - Stani check-called a bet of 300,000. Turn: - Stani checked again, and Bilyauer checked behind. River: - Stani checked a third time after the board paired. Bilyauer bet 500,000, sending Stani into the tank for four minutes. Stani riffled the calling chips, almost sliding them over the line and pulling them back five or six times before actually committing to the call. Bilyauer had hit the river as Stani feared. The Russian showed to take down the pot. He's up to 3.75 million. Kevin Stani limped his button, and Konstanin Bilyauer raised to 300,000. Stani called. The flop was , and Bilayauer bet 450,000. Stani called. After the turn, Bilyauer put out 700,000, and again, Stani called. The river was the , and this time, Bilyauer checked rather than shoving. Stani checked behind and turned over for aces and the board. Bilyauer turned over the , pausing a beat before showing the to chop the hand. Kevin Stani limped in (he's been happy to do this and just play small ball to gradually grind the Russian down) but Konstantin Bilyauer raised to 300,000. A quick call from Stani. Bilyauer fired out 450,000 when the flop came and Stani called the bet before both players quickly checked the turn. The river was the and Bilyauer thought for a moment before pushing all-in for just over the size of the pot. Stani tanked for about 3 or 4 minutes but eventually folded, asking Bilyauer to show the bluff. The Russian is back over the 3 million mark. Konstantin Bilyauer - Star Wars! Konstantin Bilyauer opened for 250,000 and Kevin Stani called in the big blind to see a flop, which both players checked. Indeed, they checked down the turn and river too, but presumably Stani had been hoping for a bet from Bilyauer on the river as he turned over for trips. Just after that double up, just as the dealer was about to start the next hand, Konstantin Bilyauer piped up. It appeared that he had counted his new doubled-up stack and had found it somewhat short. "The stacks are 475,000, not 500,000," he told TD Thomas Kremser, showing him the stacks of orange T25,000 chips that he had won from Kevin Stani. The game was held up for some minutes as Stani insisted that there was, "No way I put in 100,000 short," but Kremser established that the all in had been for exactly 1.54 million, and once Bilyauer's new stack was counted it was established that he was indeed either 75,000 or 100,000 (we didn't quite catch exactly which one, but either way it was in the region of one big blind) short of the 3.08 million he should have. Stani was made to pay up, and play continued. 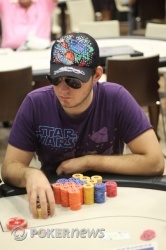 Konstantin Bilyauer was down to 1.54 million when he open-shoved for the first time during the heads-up match. But he didn't get one free pass. Kevin Stani called instantly to flip for the win. The flop was clean for Stani. Two cards to go and he'd be the EPT winner. But the turn put Bilyauer ahead. The river was the , and Bilyauer doubled to 3.1 million. Stani still has a big lead with 9.5 million.